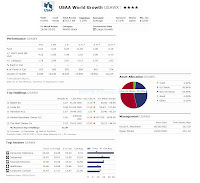 As one of the top S&P mutual funds, this USAA World Growth Fund is classified as world stock fund. This fund focuses on investing in U.S. domestic and foreign companies. Details about this best fund review can be found below. This USAA World Growth fund objective is to seek capital appreciation. This world stock fund invests assets mainly in equity securities of both foreign and domestic companies. It may invest in companies of any size or capitalization. This top fund will prioritize on companies with large market capitalizations. It may invest a relatively large percentage of its assets in a single country, a small number of countries, or a particular geographic region. Investments are selected primarily based on fundamental analysis of issuers by the fund’s management. This fund is managed by David R. Mannheim since June 2002. The fund was first introduced to public in October 1992. The expense ratio of this fund is 1.29%. The average in the World Stock category is 1.46%. This USAWX fund has 0.61% dividend yield. This dividend is distributed annually. The last dividend distributed in 2010 was $0.11. Based on the load adjusted return, this USAA World Stock fund has returned 17.12% over the past year and 5.79% over the past decade. This fund has 4-stars rating from Morningstar and is also rated as the best fund of 2011 by S&P. This Top S&P fund has recorded 14 years with positive return with the best achievement in year 2009 with 31.36%. Investors that are interested in this world stock fund can start buying it with a minimum of $2,500 initial investment for brokerage account and $250 for IRA account. The next subsequent minimum investment for both accounts is $50. This USAWX fund is currently available for purchase from 26 brokerages, such as JP Morgan, T Rowe Price, Pershing Fund Center, Dreyfus NTF, TD Ameritrade Inc, Bear Stearns, etc. The other class of this fund is the Advisor Class (Ticker: USAWX). 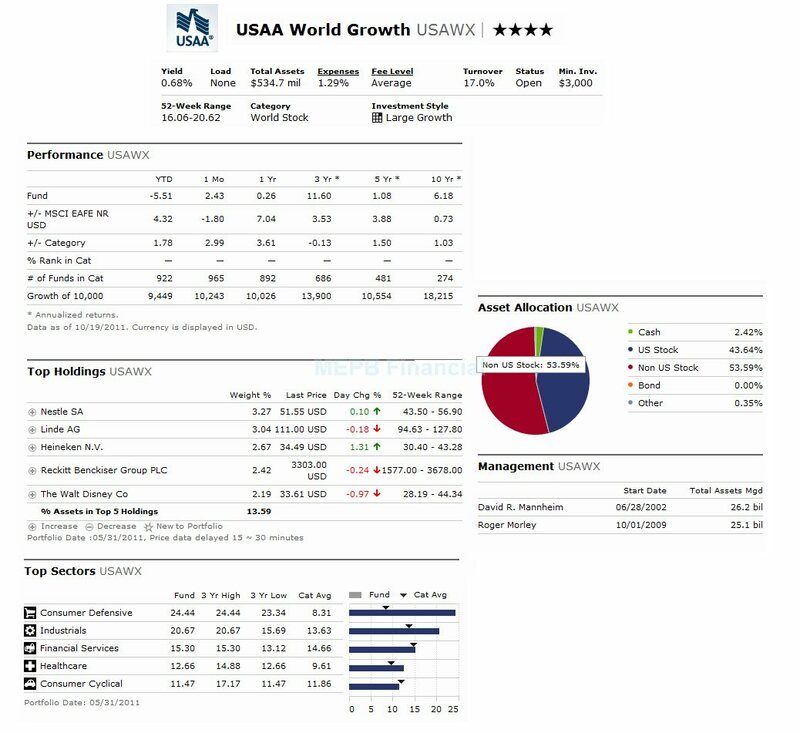 As of May 2011, the top 5 holdings of this USAWX fund are Nestle SA, Linde AG, Heineken NV, Reckitt Benckiser Group PLC, and The Walt Disney Co. The top 5 sectors are Consumer Defensive, Industrials, Financial Services, Healthcare and Consumer Cyclical.